Allison wanted to start her own little mini garden last year, so I bought her a few strawberry plants to tend to. She opted to plant them in an over sized flower pot and did pretty good with them, but for some reason they didn't grow again this year. The funny thing is, I think a chipmunk must have buried some of the strawberry seeds in other parts of MY garden because I have noticed several patches of strawberry plants popping up in a few different areas where I normally plant my tomatoes and peppers. No worries, since I can just dig them up and replant them, but if anyone has any ideas on how to keep those pesky chipmunks out of my garden, I'm all ears. I do have chicken wire around the perimeter, but so far it's proving not to be very helpful at keeping sly critters out. Our berries aren't red and ripe yet, but we have been lucky at finding big, juicy berries on the cheap at the market this month. When they go for a little over a buck for a container, I load up. 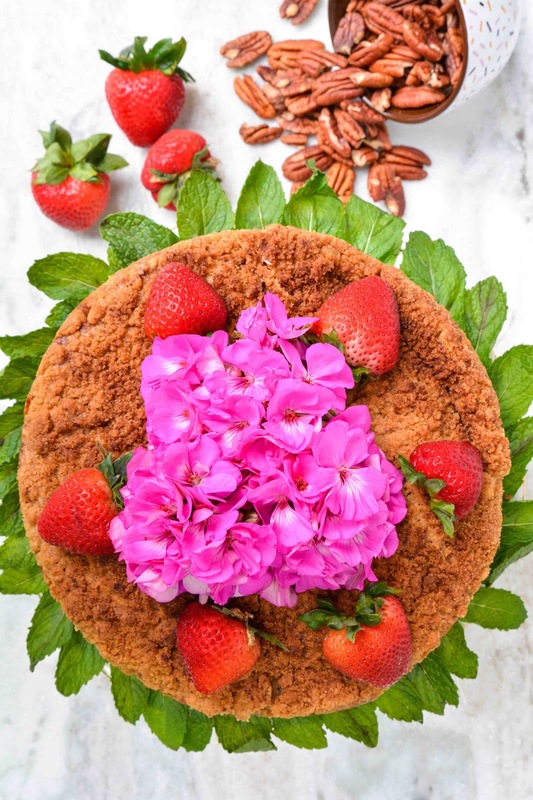 Some I'll pack in the girl's lunches, some we freeze for smoothies, and some we'll use for baking, like we did last week when we made this Strawberry-Pecan Coffee Cake. 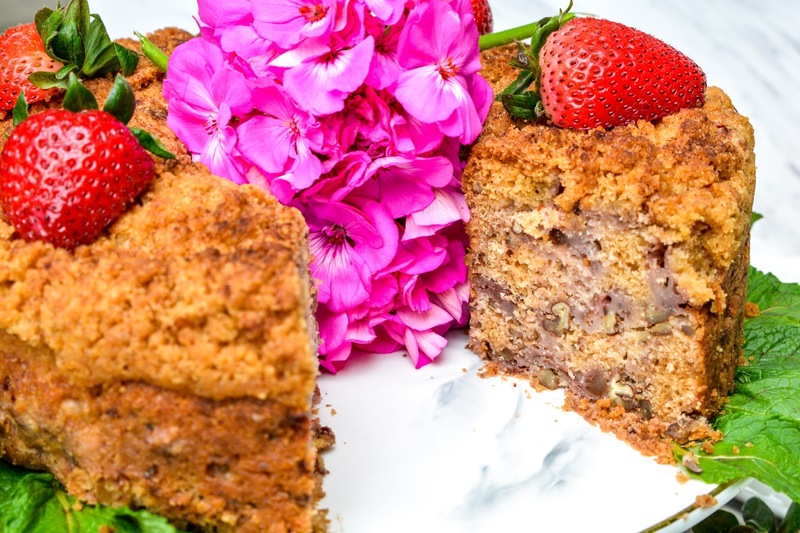 This coffee cake is loaded with sweet strawberries and crunchy pecans, and topped with an oh, so sweet streusel crumble. It's so yummy, I bet it becomes your favorite summertime dessert after your first bite. In a small bowl, combine the sugar, flour and cinnamon. Use a fork or pasty cutter to cut in butter until crumbly. Set aside. Preheat the oven to 375 degrees. Spray a1 11 inch coffee cake pan with cooking spray. Set aside. In a large bowl, sift together the flour, baking powder, baking soda, and salt; set aside. In a large bowl, stir together melted butter, brown sugar, and granulated sugar. Stir in buttermilk and vanilla. Add the wet ingredients to the dry ingredients, stirring until just moistened. Fold in the strawberries and pecans. Pour mixture into prepared pan. Using a rubber spatula, smooth the top of the cake. Sprinkle the streusel mixture over the the top of the cake. Bake 50 minutes, or until the cake is golden brown and a knife inserted into the center comes out clean. Allow to cool. Top with halved strawberries if desired. Serve. Nothing says summer like a strawberry baked dessert. I love to cut myself a slice to pair with my morning cup of tea. It's such a sweet way to start the day! And speaking of sweet, how sweet is this Puppy Hello Mug!? 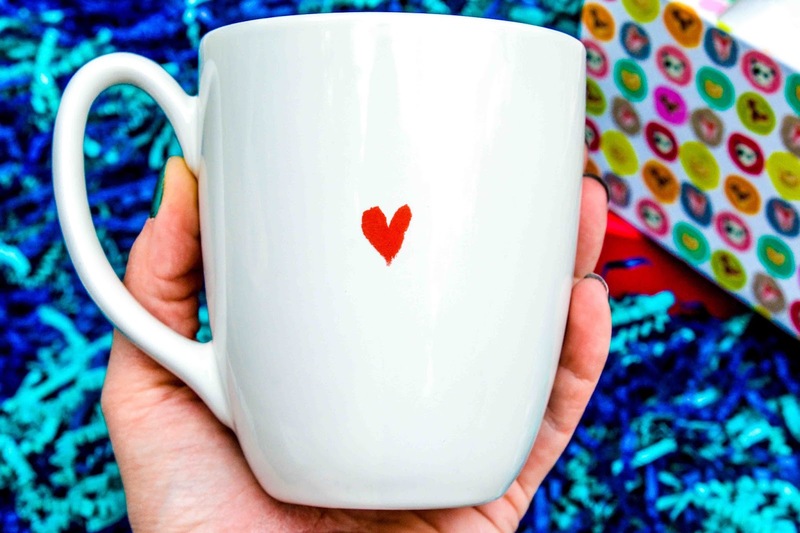 Since I am a huge tea drinker (I am a southern girl, after all) I am always on the prowl for fun mugs to brighten my day and I think this one fits the bill perfectly. You all know that in addition to my addiction to tea, I have an addiction to puppy dogs too. Combine the two, and I couldn't ask for anything more. 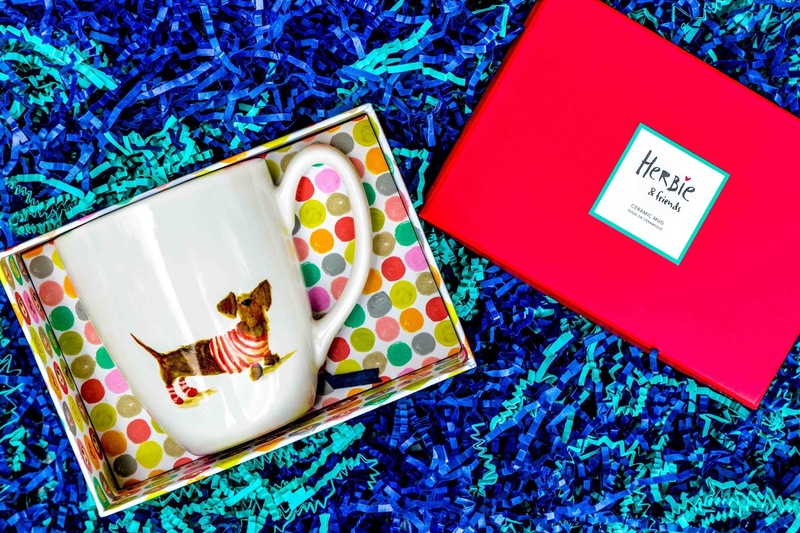 The Puppy Hello Mug comes from Papyrus, a premier stationery and greeting card retailer that offers artsy and whimsical products to its customers. Papyrus is known for their luxury paper products and greeting cards, but they also offer a wide variety of other treasures, such as candles, soaps, home decor, party supplies, bags & wallets, and drinkware. Since we are now in prime gift giving season, I highly recommend making a stop in Papyrus or visiting their online store for your gift giving needs. Not only are their product super adorable, they are gorgeously packaged and ready for gifting straightaway. I think I love the colorful box that the mug is packaged in almost as much I love the mug itself! Not only can you find this sweet puppy mug at Papyrus, they have a wide selection of other equally adorable mugs to choose from as well. 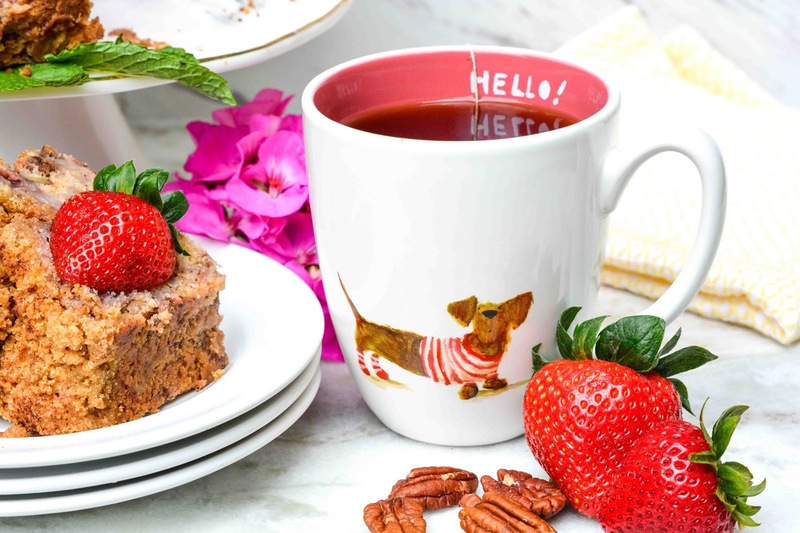 Be sure to stop by your nearest Papyrus retail store or visit Papyrus online to choose your next favorite mug to pair with this scrumptious Strawberry Pecan Coffee Cake! What are you baking with summer fruit this year? I think it's important to teach life skills early. Gardening is one that I am glad that my girls have taken a shining to. The cake looks gorgeous! I've noticed that Americans prefer dry cakes, while in my country and most of Europe we would always cut the sponge in half an fill it with some cream or filling :) The same when you in USA make layer cakes, you always have two thirds sponge and maybe one small third cream, while we put two thirds cream and one sponge :) I'd probably cut one part of your sponge, mash it with mashed strawberries and some strawberry jam and put it in the middle or on top to get the juicy, soft layer. Why do you have so many dogs if they can't be put to use in chasing the chipmunks away? :) The mug is cute indeed. I've turned to ice tea today, since it is well over 30*C here right now and I can't drink my afternoon tea hot anymore. Hopefully, first raspberries will appear on my shrub in a few weeks so I will be mashing those and putting them in my ice tea daily. You are right, there aren't a lot of cream filled cakes here. We do love our donuts cream or jam filled though! My mother-in-law is all about the frosting on the cake and would definitely prefer a 2/3 icing to 1/3 cake ratio. Trust me, my dogs are always trying to get those darn chipmunks, but the little buggers are just too fast. I bought myself a few fruit bushes over Mother's Day weekend and can't wait until they are big enough to start producing fruit that I can mash into my daily mug of tea. which fruit bushes did you buy? I bought 2 blueberry and 2 blackberry bushes. I also bought a cherry tree. I should be rolling in the fruit shortly, if those pesky wildlife critters leave my bushes alone. you should've bought raspberry as well, since blackberry and blueberry are difficult to mash for the tea having shiny, strong skin, raspberries can be mashed with a fork and have a stronger aroma. Hope your cherry tree survives, ours always die :( they're ever so sensitive! I only have limited space in the yard, so I went with the fruit bushes we'd get the most use out of. We eat way more blackberries and blueberries than raspberries, but if I would have had more room, I would have done raspberry and mulberry as well. The cup is cute indeed. Always uses for strawberries, even if just to feed the pesky critters outside haha some sure are sly. The critters are rude when they take them though. I always find half eaten fruits laying around. If you are going to steal, then at least have the decency to eat the whole dang thing! Holy moley! That looks absolutely amazing!!! I'm a little jealous of the chipmunk problem...all plants I have are very intentional (making inventive use of planters) and I don't have any strawberries. Get yourself a little porch pot and pop a few strawberry plants in there. That's what my daughter does and while she doesn't get a ton of fruit that way, it is nice to be able to pluck a few berries off to snack on from time to time. We love coffee cake. Only the one I typically make uses yellow cake mix as a base, a pie filling on the inside, and crumbles of yellow cake mix on the top. This one does look super good! This is our 2nd yr. growing strawberries. They should be good this year. I want to try this recipe! Your cake sounds really good too, Alissa! I've been admiring your grown berries on Instagram. I do hope our garden produces healthy berries like yours this year! I want to make this and then sit down and eat it all by myself so I don't have to share it. OMG yummmmmm! 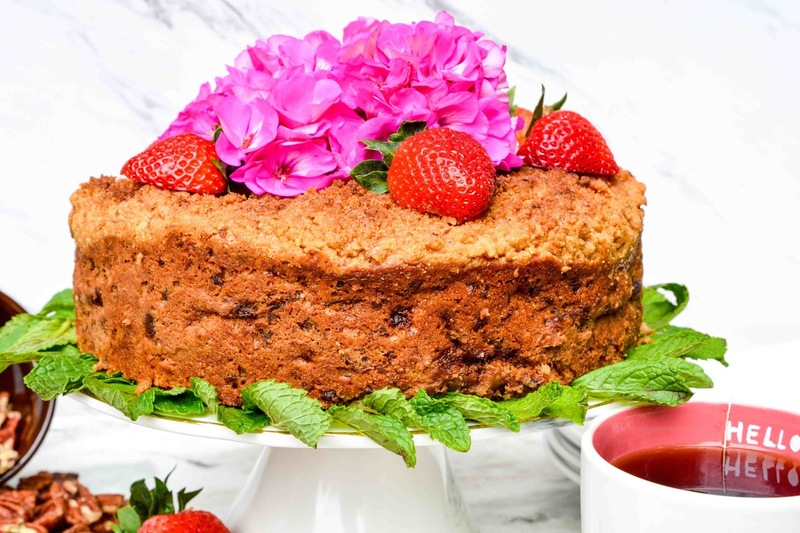 Oh what a delicious mix of flavours - I've never had strawberry and peacan in a cake but wow I bet it tastes amazing! It is such a great combo, Sarah-Louise! So perfect for summertime! That looks so amazing! I love making coffee cakes. They're actually a favorite of mine over regular cakes. Om nom nom. Now that's one tasty looking coffee cake. These types of cakes have always been my favorite. I prefer the flavor and texture of these over regular frosted cakes. I always love a sweet crumble on top of cakes over icing, so this is the most perfect cake for me. Wow, this sounds good! I bet the extra strawberry sweetness is fantastic Your mug is so cute! 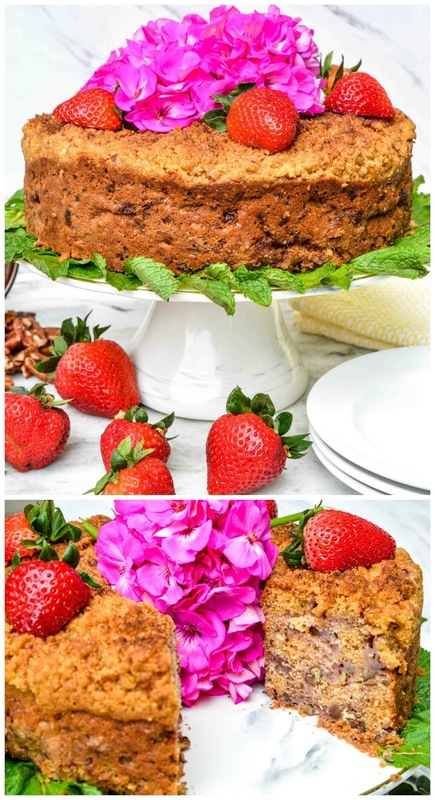 I love coffee cake and never thought to make a strawberry version! Yum! Definitely pinning this recipe. This looks so good. It is right at the end of strawberry season here so I need to make this before strawberries get pricey again. That looks so good. It also looked very pretty. This cake looks delicious! Coffee cake is my favorite! This sounds absolutely delicious. I love coffee cake with pecans! I haven't had a good coffee cake in ages. This sounds and looks like a delicious recipe! I would love to try this sometime! Sound delicious enough for me to try! Strawberries and pecans are great together. I'll make this cake on the weekend. Wish me luck! This looks like a fiber-rich coffee cake. The puppy mug looks really cute. Looks like a delicious looking coffee cake. 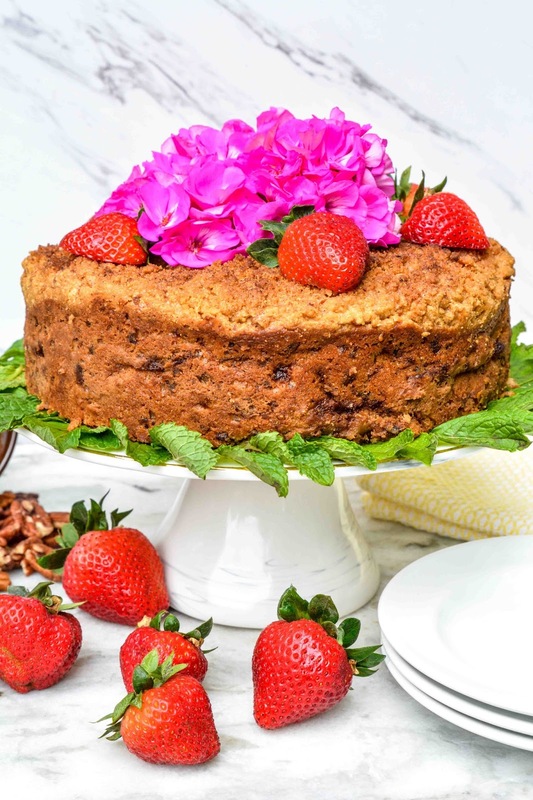 Strawberries and pecans together in a cake is a winner! I will try my hand at making one for myself! Thanks for sharing the recipe. That sounds so delicious! I would love to try it. Any cake that has pecans or walnuts is pretty good by my standards. I love a good coffee cake! Congratulations on the graduation of your child! I love coffee cakes! I think this one is a must try! My husband would definitely enjoy this as well. It's a lovely way to make use of some fresh strawberries. wish I had more time to bake more.. shall try and whip something up this weekend. I'm always so inspired when I see your recipes but so time-poor to make them..
it's super cute, Theresa..And the cake looks so delicious! l can imagine biting those yummy strawberries.